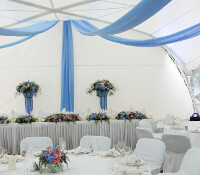 We provide a complete marquee lining hire service used generally for our wedding marquees and corporate marquee events. Our elegant lining for walls and ceilings are tailored with detailed pleating which come in a sophisticated ivory colour. High quality lined material manufactured in the UK. Hand sewn to ensure the pleating runs in the same direction. Double hemmed with each section finished to a high standard. Fire retardant to European Standards. 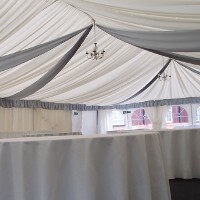 Get your Quote here for prices of your marquee lining hire. Produce a professional finish for your event interior with stylish swags and pelmets. Choose from a range of colours such as subtle ivory to vibrant metallic silver. Do something creative and give your guests the wow factor with sophisticated ceiling overlays and elegant drapes, you’ll be amazed with the finished results. Other finishes available for your event. Get your Quote here to check prices and availability of your tailored occasion. 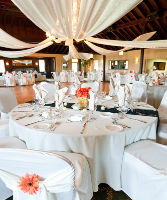 Transform your internal building and create a unique venue with our affordable and convenient themed venue dress service. We can glamorously dress your rooms to leave a lasting impression with your guests. This service is available for any style of event from a wedding reception at a intimate hotel to a grand corporate event such as an awards ceremony, product launch or Christmas party in a large venue. Sectioning off part of a building. Covering the ceilings and walls. Draping from a focal point or mid section. 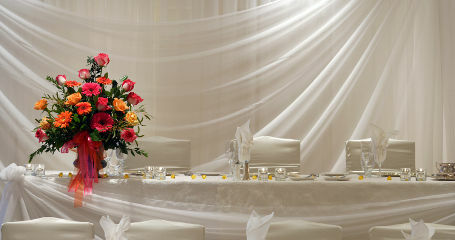 Classy chair covers for hire. Chic chair sashes and chair bows. To find out more on your venues suitability and prices contact us with your venue dressing requirements or request your Marquee Quote here. Our venue dressing service covers Leicestershire and surrounding counties. To check availability in your area contact us or use our quote form.